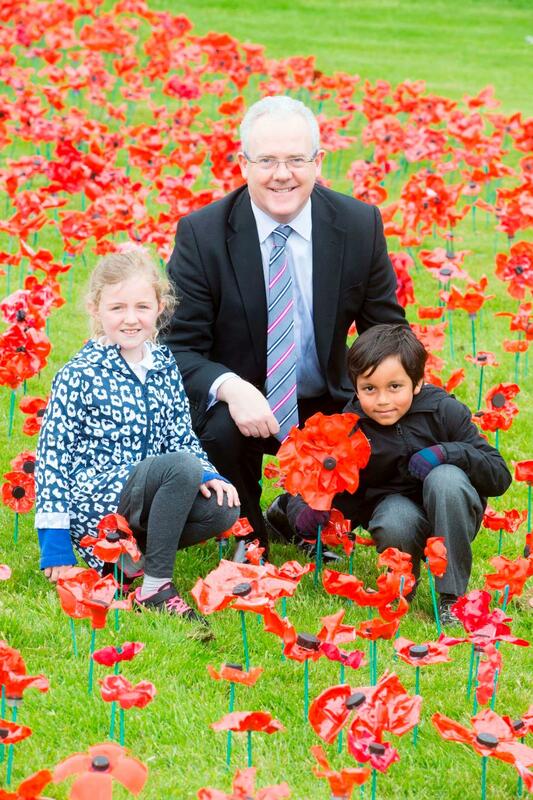 Professor Gerry McCormac, University of Stirling Principal and Vice-Chancellor pictured with St Ninian's pupils Zach Coffee and Molly Steadman-Grant at the poppy installation designed by local pupils from recycled plastic bottles. Photo: Jeff Holmes. A creative writing competition to commemorate the 100-year anniversary of the First World War Gallipoli campaign is being run by the University of Stirling for Scottish secondary schools. Launched as part of three days of city-wide events to remember the Battle, pupils are encouraged to submit a poem or short story that recreates a scene from the Gallipoli campaign. The competition is being financially supported by the Scottish Government. Last night (Thursday) on campus, Cabinet Secretary for Culture, Europe and External Affairs, Fiona Hyslop spoke prior to a Gallipoli lecture delivered by distinguished military historian Professor Sir Hew Strachan. Earlier in the day, a poppy field installation made by schoolchildren was unveiled at the University. The University and Stirling Council have organised the events (4-6 June) as part the national commemorations marking the Battle. They coincide with 100 years from the day the 52nd (Lowland) Infantry Division arrived in Gallipoli, having conducted their training in the City. The Battle of Gallipoli, also known as the Dardanelles Campaign, lasted eight months and saw the Allied Powers attempt to control the sea route from Europe to Russia. Following a failed naval attack by British and French ships on the Dardanelles Straits, British and French troops took part in a major land invasion of the Gallipoli Peninsula. Fierce Turkish resistance and unknown terrain meant the Allied Forces suffered heavy casualties and eventually evacuated. Professor Sir Hew Strachan, a renowned expert on the history of the First World War, considered the campaign and its wider importance, during his public lecture. Further events include a play at the Albert Hall, an international academic workshop, and an exhibition of images, uniforms and equipment exploring the impact of the First World War on Stirling and Scotland. Professor Holger Nehring, Head of History and Politics at the University of Stirling, said: “We are honoured to be involved in organising the commemorative events in Stirling together with the Scottish Government and Stirling Council. The events have been planned in partnership with the Scottish Government Commemorations Panel. Following its official unveiling, the poppy field installation is on public display in front of the University’s Pathfoot Building until 14 June. Media enquiries to: David Christie, Senior Communications Officer, on 0044 (0)1786 466653 or david.christie1@stir.ac.uk. ‘Creating Gallipoli. Connecting Scotland’s diverse communities through creative writing’ is open to students in Literature and History from all Scottish secondary schools (S1-S3). The best entry in each category (poem or short story) will win a £100 book voucher, the runner up a £50 book voucher, and there will be certificates for the winning schools. The deadline for submissions is 24 November 2015. Links to resources and guidance can be accessed online. Chris will be running a series of creative writing workshops over the autumn. The poppy installation has been created by Stirling school pupils out of recycled plastic bottles. Pupils involved in creating the display are from: Wallace High School, Bannockburn High School, St Modan’s High School, Killearn Primary School, Balfron Primary School and Doune Primary School, assisted by Forth Valley College.